Custom made in Germany and Canada for the Joystrings Harp. Sturdy and rigid enough for our harp, it can double as a superior music stand. Clear acrylic top lets your audience see the beauty of your harp. Custom made in Canada for the Joystrings Harp. Fits both harp models. 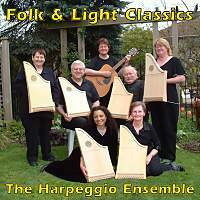 By The Harpeggio Ensemble, with guest artists The Ukrainian Dulcimers. 15 bright, lively and beautiful pieces. Listen to excerpts. By The Harpeggio Ensemble with soloist Kristin Barkman. 16 love songs from around the world. By Kathy Chattaway. 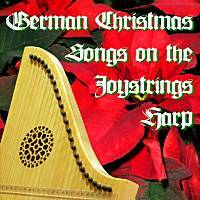 20 traditional Weihnachtslieder. Listen to excerpts. 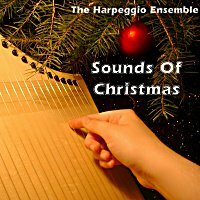 By The Harpeggio Ensemble. 8 soothing carols. Listen to excerpts. Makes it easy to tune the Joystrings Harp, or any stringed instrument. Clip the microphone to the harp and tune until you see the green light. Red lights and meter needle show which way to adjust tuning. Microphone also works with amplifiers and recording equipment. Also provides a steady beat to help your rhythm (metronome function). Earbuds included. To keep your Joystrings Harp in tune you will need a tuning key. Our T-shaped key is recommended as it has good balance. Made in Germany. A source of stable pitch to tune your harp to. Not needed if you purchase the tuning aid above.